Like most other food bloggers I love trying out new ingredients and spices. 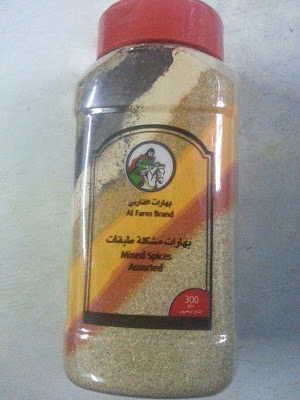 My friend Jubal told me about a garam masala mix from Bahrain that he'd got and was willing to share with me. It seemed like a regular mix of powdered garam masala that also included turmeric, coriander and pepper among other things. The different spices were layered beautifully in the bottle adding greatly to its charm! It was with quite a twinge that I emptied the contents into a large bowl and mixed up the spices so we could divide it between he two of us. The streak of black that you see near the top of the bottle is what puts this spice blend apart from other garam masala blends. That's powdered preserved lemons and it adds a fabulous flavour dimension to the mix. I had to cook dinner and there was chicken thawing in the sink. I decided to try out this newly acquired spice mix and I have a winner! 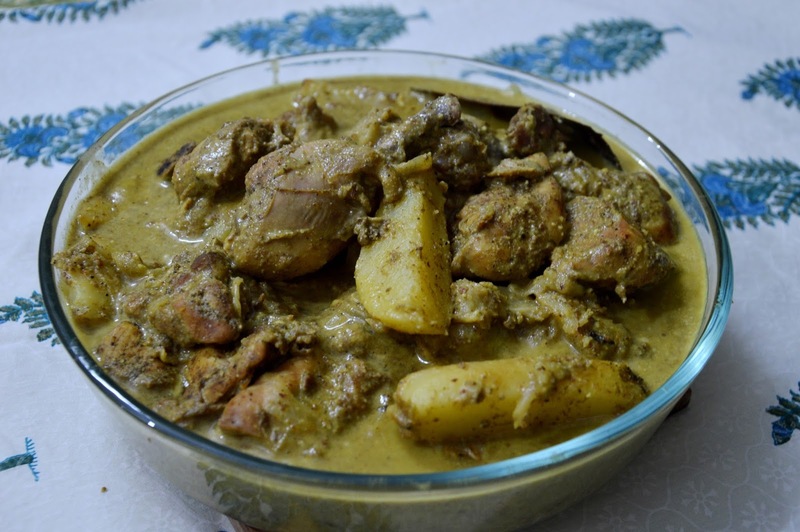 Marinate the chicken in salt, Bahraini spice and curd for a couple of hours. Heat olive oil in a large cooking pan/pot and fry the potatoes till they are lightly browned. Remove to a plate and then fry the onions. Sprinkle a little sugar to help them caramelise. Pound the garlic in a mortar and pestle and add the fresh garlic to the cooking pot. Once the onions start going pink add the chicken, leg pieces first. Cook for about 10 minutes stirring once in a while. Then add the rest of the chicken pieces reserving the marinade. Add the potatoes now. Bhunno for a bit and then cover and let it cook for another 10 minutes or so. Add a cup of water to the reserved marinade and add it to the pot. Let it all come to a boil and then simmer it till the gravy is reduced a little. Add the almond paste and cook for another 2 or 3 minutes. Check that the potatoes are done. Remove to a nice serving bowl and serve with plain steamed rice, rotis or a simple garlic and olive oil focaccia. Garnish with a few flaked almonds if you like, to make it look pretty. The spice mix has a heady lemony scent and results in a robust spicy gravy - flavourful, not hot. The almond paste gives the gravy body and richness making this dish one I'd be happy to serve at a party. Now I must google for this special masal from Bharin. The chicken dish looks so good and i love chicken dishes with potatoes in them.